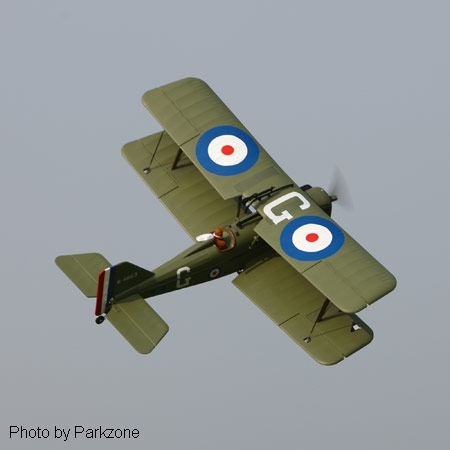 The Parkzone SE5a World War One Aircraft. The Parkzone SE5a is the first WW1 airplane from this manufacturer. This is a highly detailed and great flying electric RC airplane. The SE5A was one of the finest British fighters of the first world war. 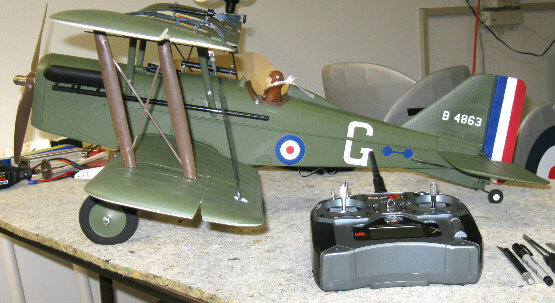 Now Parkzone have decided to make it their first WW1 RC airplane and hopefully it will be the first of many! With a wing span of 37.1" and a finished weight of 40.6oz,the attention to detail is outstanding. Manufactured from the usual Z-foam makes it tough and durable and easily repairable, if and when required. For minor damage, parts can be glued back together with foam-safe CA or epoxy. If damage is too much for a quick "glue job", then spare parts are readily available. 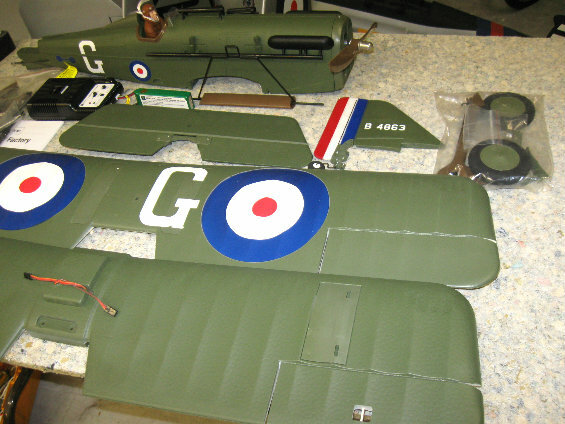 Simulated wing ribs can be seen, as well as a nice paint scheme, although I do not think that the RAF roundels on the wing and fuselage are in scale position. The video here gives up-close detail and some very nice flying shots. The wood like finish on the interplane struts, landing gear and propeller add to the overall impression of a good looking WW1 RC biplane. One interesting detail, is that a tail-skid and a steerable tail wheel are included. The skid is closer to scale, but I would use the tail wheel, to make ground handling a lot easier. Note that the 4-ailerons require just 2-RC servos. the upper ailerons are connected to the lower ones with a pushrod. A Spektrum AR 600 DSM2/DSMX receiver is installed (BNF only) and you will need a 4-channel compatible, 2.4GHz RC transmitter. The Parkzone SE5a is powered by a 480 size outrunner brushless motor (960Kv) and a 3S 1800mAh 15C lipo battery (BNF only) is included along with a 2-3 cell DC variable rate charger (BNF only). The RC ESC is a 30Amp Pro switch-mode BEC brushless. The wings can be removed, for transportation but I would leave them attached, so as I could fly ASAP! A 37" span RC biplane will fit in my car, in one piece. The SE5A comes as a BNF or as a PNP version. Both versions are 100% complete, with a minimum of assembly time. The BNF (Bind-N-Fly) version has everything required except a 4-channel transmitter. The PNP (Plug-N-Play) type requires a transmitter, receiver, battery and charger. This photo gives a good idea as to how efficient the packing job is. Every part was there and no damage was evident on any part! Completely finished and painted airframe. Spektrum AR 600 DSM2/DSMX receiver- installed. Rudder, aileron, throttle and rudder controls. E-Flite 30A Pro Switch-Mode ESC-installed. Pilot, exhaust and machine gun details. Complete hardware package including a few spare screws-an excellent idea! Here we can see the Parkzone SE5a unpacked. The control surfaces are hinged and all the decals are applied, as you can see. Assembly was very easy, by following the manual. Total time was about an hour and no problems were encountered. 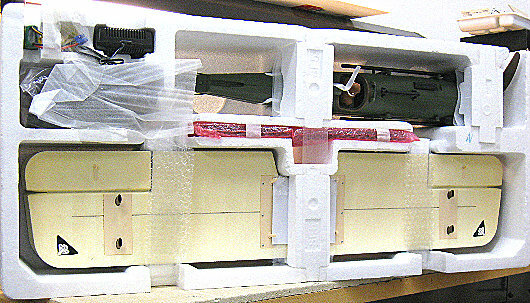 Altogether the packaging and assembly were first rate and showed excellent engineering and attention to detail. Here is the completed model with the brand new Spektrum DX6i transmitter. This is the first new radio I have purchased in a long tome and let us just say I am very impressed! The overall control is very solid, with precise control surface movement. Can't wait to fly it! If you are looking for spare parts for this model CLICK HERE to visit the appropriate page on the Horizon Hobby web site.